Our education services are hands-on experiences that involve students in environmental research, inventory or monitoring projects. Below is the process that you can expect from me, starting with my first visit. I provide curriculum materials and workshops for teachers in all areas of the environment, from hazardous waste, toxicity, environmental chemistry, and environmental issues to natural history. Only for secondary education. This is the report for the PIER program I did for DEP under a grant. 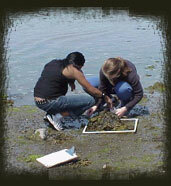 It is an example of a research/monitoring program done with a number of schools during 2004 and 2005.